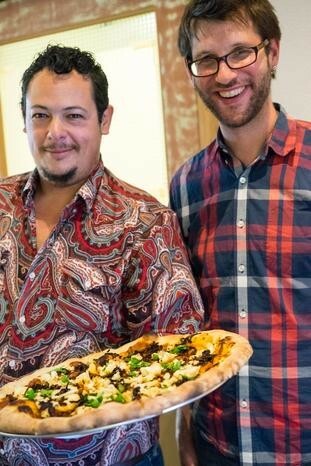 Owners Nick Yapor-Cox (left) and Aron Ford. 1) Nick and Aron’s (4316 Telegraph Ave.), the new restaurant-bakery from the folks behind Nick’s Pizza — creator of the self-styled, sourdough-crusted “Oakland-style” pizza — is now open in the old Barkada space in Temescal, Inside Scoop reports. What the Fork first brought news of the restaurant, with its plans for an expanded menu that goes beyond just pizza, back in February. As Scoop notes, Nick and Aron’s will feature morning pastries, Scarlet City coffee, dinner entrées such as lamb meatballs and roasted chicken, and, of course, pizza — available by the slice and as whole pies. 2) Noted taco eater (and former Express critic) John Birdsall put together a list of his favorite tacos in Oakland’s Fruitvale district for Eater — with some tamales and tostadas mixed in for good measure. I trust his Birdsall’s taste in tacos completely, and eating your way through the entire list sounds like a good way to spend a Saturday afternoon. 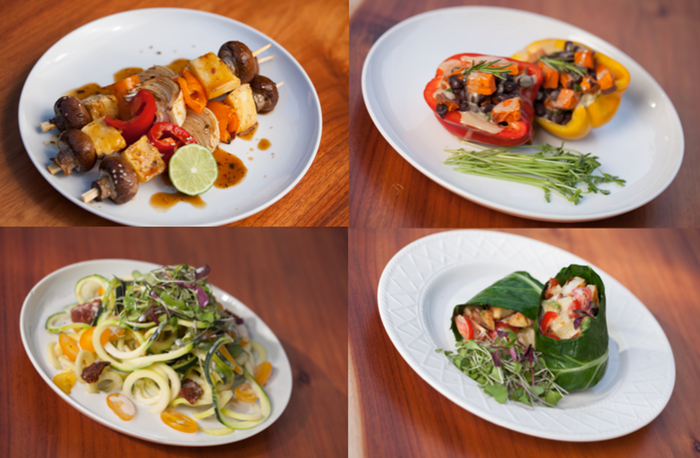 Some of the 100-percent produce-based offerings at Core Kitchen. 3) A vegan, all-produce fast food restaurant is coming to downtown Oakland, the San Francisco Business Times reports. Core Foods, an Oakland-based company whose main line of business is selling meal replacement bars, is aiming to open Core Kitchen at 12th and Broadway. According to SFBT, all menu items will be made from 100-percent produce — down to the portabella mushroom pizza “crusts” and burritos that are wrapped with collard greens. The self-described “world’s most nourishing restaurant” has launched a $90,000 Kickstarter campaign to help meet the company’s goal of opening in August. 4) Today, the federal government announced that it has awarded a $37 million grant to the Berkeley-based Ecology Center. Among other initiatives, the money will allow the center to expand the reach of its Market Match program, which doubles the value of CalFresh benefits when shoppers use them to buy fresh produce at participating farmers’ markets. Check out Sam Levin’s story for additional details. 5) Passover is coming (April 3-11), and J Weekly has a nice roundup of dining options for those looking to celebrate, including several in the East Bay: Comal, Saul’s, and Beauty’s Bagel Shop among them. Check out the full list with menu details here. 6) The casual Beer Shed portion of the James Syhabout and Adam Lamoreaux-owned Dock at Linden Street (95 Linden St., Oakland) has launched a couple of new programs, including a Hangover Brunch — on Sundays from noon to 5 p.m. — whose offerings include an al pastor pork chop torta and “James’ Breakfast”: two slow-poached eggs with soy sauce, white pepper, and and scallions over grilled pain de mie soldiers. The beer garden also has some new happy hour specials from 4:30 to 6 p.m. Tuesday through Friday: $1 off draft beers and a $6 house Michelada. 7) The new Rockridge location of Philz Coffee (at 6310 College Ave.) officially opened today, Inside Scoop reports. The coffee shop is part of the big Safeway complex that opened earlier this year. 8) If you haven’t made any plans yet for the afternoon, La Snackeria (815 Washington St.), Tina Tamale’s Chino-Latino restaurant, is hosting a fundraiser today, April 1 — from 4 to 8 p.m. — for the Oakland Spirit Orchestra, a community music group made up of Oakland elementary and secondary school kids. The Big Red Beer Wagon will be on hand to sell $5 Bison Organic Beer, and food options — both entrées and snacky things — will sell for $3-$12, with proceeds going to support the orchestra. 9) In other music-related food news, Blue Bottle's W.C. Morse building cafe is hosting a "Cup of Classical" event on Thursday, April 2, from 6:30-9 p.m., featuring members of the Oakland East Bay Symphony. The $25 ($35 at the door) price of admission includes coffee and dessert. Check out additional details here. 10) Finally, in case you missed it, here’s everything you need to know about a UC Berkeley-led movement to get people to eat edible weeds and a new grocery store coming to Uptown Oakland.